One of the great benefits of homeschooling is the education parents can receive - most often an education very unlike the one they received when THEY were young. It is an HONOR to learn alongside my daughter this year in Classical Conversations Challenge B as she tackles ideas and subjects that truly do CHALLENGE her. I could sense Anna's growth as she plowed through Challenge A last year (interested in her year? - read my reflections and tips from Challenge A). 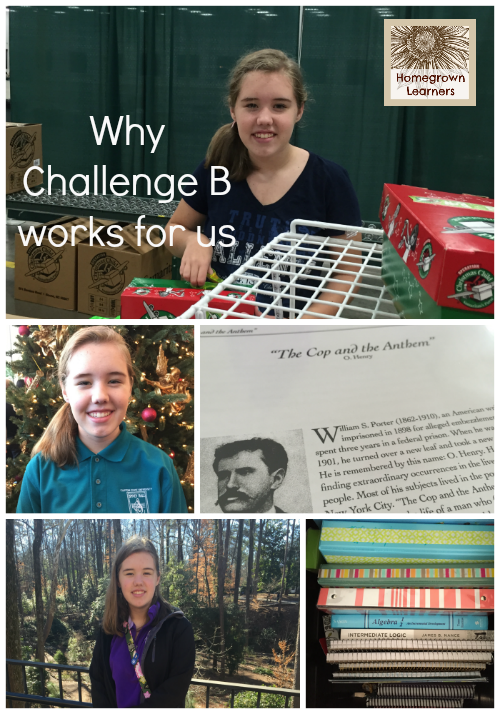 This year, as we can see the finish line for Challenge B, I am struck by the intellectual and emotional maturity I have seen develop in my daughter. I am struck by the tremendous sense of accomplishment she derives from doing hard things. I am struck by her independence, organization, and motivation. "When students learn self-discipline, they can achieve ANYTHING." I am here to tell you that I agree and I am so impressed with how CC has organized the Challenge curriculum to help middle and high schoolers achieve this goal. That self-discipline, however, MUST BE MODELED BY THE PARENTS. Do not expect your children to be successful in Challenge if you think you can abdicate your role as teacher or view it as a "drop-off" program. That simply will not work. You must be willing to commit yourself 100% to a rigorous Classical education. *Disclaimer: I am in no way affiliated with Classical Conversations (other than as a parent). I have not been compensated for this post, and these opinions are 100% my own. This post may contain affiliate links. Last year, in Challenge A, scheduling weekly work was a joint task between the parent and child. I would guide Anna in scheduling her week - day by day and subject by subject. As is typical for a seventh grader, she would procrastinate, underestimate the amount of time needed for work, and rely on many reminders from mom. She was LEARNING the art of time management, and I appreciated being able to guide her in a safe, caring environment. This year, in Challenge B, she schedules 100% of her work on her own. We have approximately a one hour meeting the day AFTER our community day, to make sure we are on track with what needs to be accomplished for the week. We meet again the day BEFORE community day so she can "check out" with me - which basically means all of her work must be completed and presented to me. Oh yes - we've had a few painful day before class check out meetings, where assignments have been skipped or fudged. I've noticed, however, that in the past 3 weeks she has been extremely diligent and rarely misses something. This isn't because she's a super aweomse kid (well - I think she is!! ); it is because she has been TRAINED to budget her time and knows that skipping or fudging will only hurt her in the end. There have been so many specific questions - from readers and in real life homeschooling friends - about the nitty gritty of Challenge - that I want to go through each subject area in a little depth. I won't sugar coat this. I believe, however, it is WORTH IT. In Challenge B, students work through the Henle Latin text at a faster pace than they did in Challenge A.
Latin in Challenge A was a blur for both Anna and I, but (as I am finding with so much in CC - and it's a brilliant design) the information is repeated again in Challenge B - and this time it made much more sense! The pace for Latin is quick. We spend one hour each day on Latin -- and I say we because I normally sit with Anna and try to learn this along with her. It is one of two areas of her curriculum (the other being math) where I stay 100% up to speed because I promised her if she stuck with Latin I would, too. To make things more understandable we have been using the Memoria Press Henle Latin Study Guides. These just break the information down into more manageable bites. This year, Anna will be taking the National Latin Exam (not something required by CC) and is taking a NLE Prep Course through Memoria. Recently I've heard a lot of doubting about the study of Latin. WHY do students in Challenge need SIX YEARS of Latin? WHY is Latin important? WHY are we spending so much time on LATIN? I love CC's answer in The Top Five Reasons to Study Latin. I think at this age it's HARD to homeschool in general, and sometimes the tendency would be to let your kids off the hook with a really hard subject. Please resist that tendency. I am seeing that Latin is invaluable, and we intend to stay the course. We use the recommended Saxon math curriculum. Anna is currently completing Algebra 1/2. Again - no frills here. It's hard work. Each day she completes one full lesson (30 practice problems each day) and takes all scheduled tests. My "I hate math!" kid is making 90 and above consistently and will tell you she still doesn't like math that much, but she knows she can do it. She's also proud of her work and, through dialectic math conversations with her peers and tutor, is learning that math integrates with ALL subject areas. Math is built on the same structure as Logic. As my daughter is doing Logic problems she is seeing the correlation. Using an Intermediate Logic text, Anna is understanding and LOVING Logic. It is her favorite subject by far. She has lessons and exercises to complete each day, which I simply grade and go over with her if there are any problems. Last weekend she was struggling through a concept, and when we simply sat together and she started to explain it to ME, then it clicked for her. She learned the GRAMMAR of Logic, was passing through the DIALECTIC phase, and jumped into the RHETORICAL phase - all in the span of an hour. 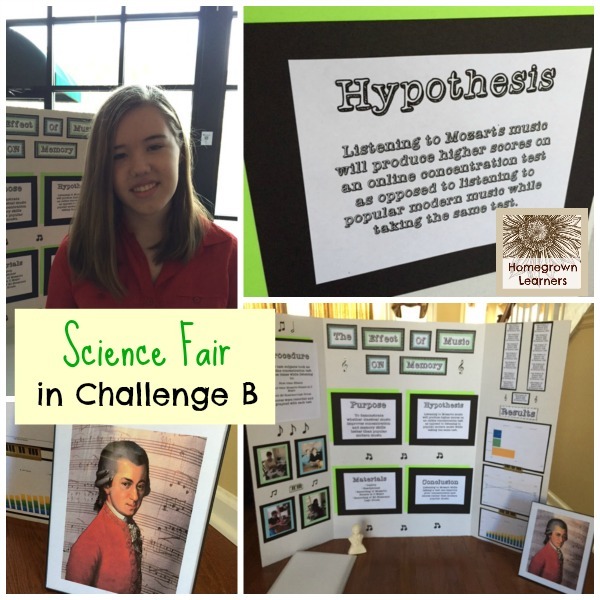 Earlier in the year Anna completed a semester of The History of Science - researching famous scientists, placing them on a timeline, writing a paper about each, and presenting about them. There was also much discussion about whether their religion (if they were religious) had an impact on their careers. One of the highlights of this year is the science fair. I loved that the students were prepped every step of the way and had a couple of months to complete their projects. This was one of the first times where I saw my daughter take COMPLETE ownership of a project... ZERO help from mom or dad. Her project, The Effect of Music on Memory, was well received and (I think!) very interesting. You hear all those horror stories about science fairs, and I'm happy to report there was no horror associated with this science fair! For the rest of the semester the students will be reading and discussing Defeating Darwinism by Opening Minds - quite a lofty book, but one that stretches their minds. First semester was spent preparing the kids for debate by researching and reporting on current events topics. These included euthanasia, gun control, GMOS, and Common Core. Students learned to research BOTH sides of an issue and how to defend both sides as well. Now, second semester will be mock trial - something all of the students are looking forward to. They have an actual case with all of the supporting police documents and witness statements. I can't wait for Mock Trial day! Using The Lost Tools of Writing, Challenge B students have been learning to write essays for the past two years. Because of the repeated exposure to the process, and the length of exposure, Anna can now write a persuasive essay easily and well. In the first semester the students read The Phantom Tollbooth, The Hiding Place, Little Britches, The Witch of Blackbird Pond, and Where The Red Fern Grows. Literature selections are purposely "easy" to allow students to focus on writing an essay for each book. Now, in second semester, Anna will be exposed to many short stories and by the end of the semester write her own short story (which allows for time management of a project over an entire semester). Her tutor has a hot chocolate and tea Short Story time in class (which the kids LOVE), and at home I try to read the short story aloud for our whole family, and then we discuss. Discussions (in all areas of the curriculum) are SO IMPORTANT during these years! There are so many reasons Challenge B works for our family - but I realize this might not be the way for everyone to homeschool. And, please don't misunderstand, we have had our bumps in the road just like any other homeschooling family. There have been struggles, tears, and questions. But in the end, we have grown together and believe in Challenge. I am realizing that we are growing a learner - growing a thinker - and growing a Christ lover. This takes times, patience, and perseverance. Classical Conversations allows ME to retain the role of teacher. They do NOT assign grades. They do NOT dictate every aspect of the curriculum. I am free to make adjustments as need be. I am free to nurture my child's God given talents and abilities, while offering her an exceptional education at the same time. We have backed off a bit in certain areas to allow Anna time to pursue a volunteer opportunity that means a lot to her. She devotes a lot of time to her music - and that is every bit as important as her academics. The connections I am seeing between Foundations, Essentials, and Challenge just amaze me. It is a beautifully crafted program. The connections between all disciplines - and that connection between all disciplines and GOD - is what drew me to Classical Conversations, and it is what keeps us going back each year. "Am I advocating that Challenge parents learn every single thing that the Challenge student learns? No. As stated, they should be developing into relatively autonomous learners, learning how to learn. However, you should at least learn some things alongside them and at least be familiar with other things. Classical Conversations is all about the conversation; the crux of the learning occurs during the conversations. Mastering the material and learning to love learning solidifies into real knowledge, understanding, and wisdom when the students engage in meaningful discussion. If these discussions only occur one day a week in class, then I daresay the point of CC is being missed." It is my prayer that this post has been helpful to those of you contemplating Challenge, and to those of you in Challenge. I made sure to obtain Anna's permission to write this post. Protecting her privacy at this age is very important to me. She wanted me to include something about her "supplies"... it may sound silly, but I think one of her favorite things has been all of her binders, highlighters, note cards (you use PLENTY in Challenge! ), and WASHI TAPE. She told me: "Washi Tape Makes Challenge Fun!" She now loves organization (because Challenge has FORCED her to become organized) and enjoys having fun tools at her disposal. If you want to know more about our experience with CC visit Our Journey Through Classical Conversations.